Demi Lovato has been making her way cross-country this past year in support of her 2013 self-titled fourth studio album, Demi. The album has produced three Top 40 hits on the Hot 100 chart and is using the momentum to back her highly anticipated fifth studio album. Lovato is expecting to release the 2015 album via Hollywood Records and plans to hit the studio now that her North American tour wrapped up this past weekend. “The plan is for her to go back into the studio and start the next creative process. She’s already done some songs, but certainly the majority of it will kick off next year,” Lovato’s manager Phil McIntyre told Billboard. Though no release dates have been discussed Lovato will begin the creative process and working towards a fifth studio album. 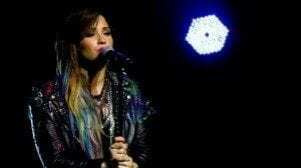 Lovato will continue her world tour throughout the process leading into next year. After returning to the U.S. X Factor as a judge Lovato returned to the road and played two arena shows before embarking on her spring tour, the Neon Lights tour which was immediately followed by the Demi World Tour that took place this fall and wrapped up this past weekend. Meanwhile, Lovato will be embarking on a European run of her world tour on Nov. 16. I simply want to say I’m beginner to blogging and site-building and certainly loved you’re web site. Most likely I’m planning to bookmark your site . You actually come with incredible articles and reviews. Many thanks for sharing with us your blog site. Hey there, precisely became informed of your blog by means of Yahoo, found that must be really interesting. I am going to be cautious for brussels. I may be delighted if you happen to keep on this sometime soon. Numerous folks probably be benefited from your blogging. Many thanks! Just desire to say your article is as astonishing. The clearness in your post is simply cool and i can assume you are an expert on this subject. Fine with your permission let me to grab your feed to keep up to date with forthcoming post. Thanks a million and please continue the gratifying work. Usually I don’t read post on blogs, however I would like to say that this write-up very forced me to try and do so! Your writing style has been surprised me. Thank you, very great article. I do trust all the ideas you’ve introduced in your post. They are really convincing and can definitely work. Still, the posts are too brief for newbies. Could you please extend them a bit from next time? Thank you for the post. I truly enjoy reading on this site, it has fantastic content . “I have a new philosophy. I’m only going to dread one day at a time.” by Charles M. Schulz. My wife and i felt joyful that Chris managed to do his web research with the ideas he received when using the web site. It’s not at all simplistic to just be giving away hints which some people have been making money from. Therefore we discover we need the writer to appreciate because of that. Those illustrations you’ve made, the straightforward website menu, the friendships you will assist to engender – it is mostly awesome, and it’s really letting our son in addition to the family imagine that the content is exciting, which is tremendously essential. Many thanks for all! I’ve learn some good stuff here. Certainly value bookmarking for revisiting. I surprise how much attempt you set to create this sort of great informative web site. Hello there! Someone on my Myspace group mentioned this informative website here so that I got to take a look. I undoubtedly enjoy the information. I am bookmarking and will also be tweeting this one to my followers! Awesome blog and outstanding design and style. Great goods from you, man. I’ve understand your stuff previous to and you are just extremely magnificent. I really like what you’ve acquired here, really like what you’re stating and the way in which you say it. You make it entertaining and you still care for to keep it sensible. I can’t wait to read far more from you. This is really a wonderful website. Excellent post. I was checking constantly this blog and I am impressed! Very helpful info specially the last part 🙂 I care for such information a lot. I was seeking this particular info for a very long time. Thank you and good luck. Valuable information. Fortunate me I discovered your site by accident, and I am surprised why this coincidence did not came about earlier! I bookmarked it. Very efficiently written story. It will be supportive to anybody who usess it, as well as yours truly :). Keep doing what you are doing – looking forward to more posts. Hi there. I found your blog by way of Google at the same time as looking for a comparable matter, your website came up. It seems great. I have bookmarked it in my google bookmarks to visit then. I was just seeking this info for some time. After 6 hours of continuous Googleing, at last I got it in your web site. I wonder what’s the lack of Google strategy that do not rank this kind of informative web sites in top of the list. Normally the top sites are full of garbage. Hi there, I discovered your website by way of Google whilst looking for a comparable subject, your website got here up, it appears to be like great. I’ve bookmarked it in my google bookmarks. I cannot really think just how much for this I should not comprehend. Thanks for writing this resources. I am certain to go back on this site to find when there is any new content. Hello there. I found your web site by way of Google even as looking for a similar matter, your site came up. It looks good. I’ve bookmarked it in my google bookmarks to visit then. Hello there. I discovered your site by the use of Google while looking for a comparable matter, your site came up. It seems to be great. I have bookmarked it in my google bookmarks to come back then. Hey there. I discovered your blog via Google while searching for a similar matter, your site came up. It looks great. I have bookmarked it in my google bookmarks to visit then. Hey there. I discovered your website via Google while looking for a similar matter, your website got here up. It seems good. I have bookmarked it in my google bookmarks to visit then. Hey there. I discovered your site by the use of Google at the same time as looking for a comparable subject, your web site got here up. It seems to be good. I have bookmarked it in my google bookmarks to come back then. Hey there. I discovered your website by the use of Google while searching for a comparable subject, your site came up. It appears to be great. I’ve bookmarked it in my google bookmarks to visit then. Hello there. I discovered your site via Google at the same time as looking for a comparable topic, your site got here up. It appears good. I have bookmarked it in my google bookmarks to visit then. Hiya, I am really glad I’ve found this info. Nowadays bloggers publish only about gossip and internet stuff and this is really annoying. A good web site with interesting content, this is what I need. Thanks for making this web site, and I will be visiting again. Do you do newsletters by email? Hi there. I found your web site by means of Google while looking for a comparable topic, your site came up. It looks good. I’ve bookmarked it in my google bookmarks to visit then. Hiya, I am really glad I have found this info. Today bloggers publish just about gossip and net stuff and this is actually annoying. A good blog with exciting content, that is what I need. Thanks for making this site, and I’ll be visiting again. Do you do newsletters by email? Hey there. I discovered your website by means of Google even as searching for a related topic, your site came up. It seems great. I’ve bookmarked it in my google bookmarks to visit then. Hello there. I found your web site via Google at the same time as looking for a related subject, your web site came up. It looks good. I’ve bookmarked it in my google bookmarks to come back then. Hi there. I discovered your web site by the use of Google while looking for a related matter, your site came up. It seems to be good. I’ve bookmarked it in my google bookmarks to visit then. Hi there. I discovered your website by means of Google while searching for a related matter, your site came up. It appears to be good. I’ve bookmarked it in my google bookmarks to visit then. Hi there. I discovered your web site by the use of Google even as searching for a comparable topic, your site came up. It seems to be good. I have bookmarked it in my google bookmarks to visit then. Hiya, I am really glad I have found this info. Today bloggers publish just about gossip and net stuff and this is actually irritating. A good site with exciting content, this is what I need. Thank you for making this web site, and I will be visiting again. Do you do newsletters by email? Hello there. I discovered your site by way of Google while searching for a related subject, your web site came up. It seems good. I have bookmarked it in my google bookmarks to come back then. Hello there. I found your website by means of Google whilst looking for a comparable subject, your website came up. It appears to be great. I have bookmarked it in my google bookmarks to come back then. Hiya, I’m really glad I’ve found this information. Nowadays bloggers publish just about gossip and web stuff and this is actually annoying. A good site with exciting content, this is what I need. Thanks for making this web site, and I will be visiting again. Do you do newsletters by email? Hello there. I found your site by way of Google while looking for a comparable topic, your web site came up. It appears good. I have bookmarked it in my google bookmarks to visit then. Hello there. I discovered your website via Google at the same time as searching for a comparable topic, your site got here up. It appears great. I have bookmarked it in my google bookmarks to visit then. Hey there. I found your site by way of Google while looking for a comparable matter, your site came up. It seems good. I’ve bookmarked it in my google bookmarks to come back then. Hiya, I’m really glad I’ve found this info. Nowadays bloggers publish only about gossip and net stuff and this is really frustrating. A good site with exciting content, this is what I need. Thanks for making this web site, and I will be visiting again. Do you do newsletters by email? Hey there. I found your web site by way of Google whilst searching for a comparable subject, your web site got here up. It seems good. I’ve bookmarked it in my google bookmarks to visit then. Hiya, I am really glad I’ve found this information. Today bloggers publish only about gossip and net stuff and this is actually frustrating. A good blog with interesting content, that’s what I need. Thanks for making this web site, and I will be visiting again. Do you do newsletters by email? Hiya, I’m really glad I have found this information. Nowadays bloggers publish only about gossip and web stuff and this is really irritating. A good website with exciting content, that’s what I need. Thank you for making this web-site, and I will be visiting again. Do you do newsletters by email? Hey there. I discovered your site by means of Google at the same time as searching for a related subject, your site came up. It seems great. I have bookmarked it in my google bookmarks to come back then. Hello there. I discovered your web site via Google at the same time as looking for a comparable topic, your site came up. It seems great. I’ve bookmarked it in my google bookmarks to visit then. you are a real very good webmaster. The web site loading speed is amazing. It appears you do any sort of unique trick. What is more, The message are masterwork. you have done a great job on this subject! Hi there. I found your web site by means of Google whilst searching for a related subject, your website got here up. It appears great. I’ve bookmarked it in my google bookmarks to come back then. Hey there. I discovered your site via Google even as searching for a related topic, your website got here up. It appears good. I have bookmarked it in my google bookmarks to come back then. Hello there. I found your website by the use of Google at the same time as searching for a comparable subject, your site got here up. It seems good. I have bookmarked it in my google bookmarks to come back then. Hi there. I found your web site by means of Google at the same time as searching for a similar subject, your web site came up. It seems great. I have bookmarked it in my google bookmarks to visit then. Hiya, I am really glad I have found this info. Nowadays bloggers publish only about gossip and web stuff and this is really frustrating. A good web site with interesting content, this is what I need. Thank you for making this web-site, and I’ll be visiting again. Do you do newsletters by email? Hiya, I am really glad I’ve found this information. Today bloggers publish only about gossip and web stuff and this is really frustrating. A good blog with exciting content, this is what I need. Thank you for making this web-site, and I will be visiting again. Do you do newsletters by email? Hiya, I am really glad I have found this information. Today bloggers publish only about gossip and internet stuff and this is really annoying. A good blog with exciting content, that is what I need. Thank you for making this site, and I’ll be visiting again. Do you do newsletters by email? Hiya, I’m really glad I’ve found this info. Nowadays bloggers publish just about gossip and web stuff and this is really irritating. A good site with interesting content, that is what I need. Thanks for making this web-site, and I will be visiting again. Do you do newsletters by email? Hey there. I found your website by way of Google while looking for a related topic, your web site got here up. It seems to be good. I have bookmarked it in my google bookmarks to visit then. Hiya, I’m really glad I have found this info. Today bloggers publish only about gossip and internet stuff and this is really frustrating. A good website with exciting content, that is what I need. Thanks for making this web site, and I’ll be visiting again. Do you do newsletters by email? Hello there. I discovered your website by way of Google at the same time as looking for a similar matter, your website got here up. It looks good. I have bookmarked it in my google bookmarks to visit then. Just desire to say your article is as astounding. The clearness in your post is just cool and i can assume you’re an expert on this subject. Well with your permission allow me to grab your feed to keep up to date with forthcoming post. Thanks a million and please carry on the enjoyable work. Hiya, I’m really glad I’ve found this info. Nowadays bloggers publish only about gossip and net stuff and this is actually frustrating. A good blog with interesting content, that’s what I need. Thank you for making this web site, and I will be visiting again. Do you do newsletters by email? Hello there. I discovered your site by way of Google while searching for a similar topic, your web site got here up. It seems to be great. I have bookmarked it in my google bookmarks to come back then. Hi there. I discovered your web site by the use of Google at the same time as searching for a comparable topic, your site came up. It looks good. I have bookmarked it in my google bookmarks to visit then. Hi there. I discovered your web site by way of Google whilst looking for a comparable topic, your site got here up. It appears good. I’ve bookmarked it in my google bookmarks to come back then. Hey there. I discovered your web site via Google at the same time as searching for a related topic, your site came up. It appears great. I’ve bookmarked it in my google bookmarks to visit then. Hi there. I discovered your blog by the use of Google even as looking for a similar subject, your site came up. It seems to be great. I have bookmarked it in my google bookmarks to come back then. Hiya, I’m really glad I have found this info. Today bloggers publish only about gossip and web stuff and this is really frustrating. A good blog with exciting content, that is what I need. Thanks for making this site, and I’ll be visiting again. Do you do newsletters by email? Hiya, I am really glad I have found this info. Nowadays bloggers publish only about gossip and net stuff and this is actually annoying. A good web site with exciting content, this is what I need. Thanks for making this web site, and I will be visiting again. Do you do newsletters by email? Hiya, I am really glad I’ve found this info. Nowadays bloggers publish only about gossip and web stuff and this is actually annoying. A good site with exciting content, that’s what I need. Thanks for making this website, and I’ll be visiting again. Do you do newsletters by email? Hiya, I’m really glad I have found this info. Nowadays bloggers publish just about gossip and internet stuff and this is actually irritating. A good site with exciting content, that’s what I need. Thanks for making this web site, and I will be visiting again. Do you do newsletters by email? Hey there. I found your website via Google while searching for a comparable matter, your website came up. It appears good. I have bookmarked it in my google bookmarks to come back then. Hey there. I discovered your site by the use of Google while looking for a similar topic, your web site got here up. It looks good. I’ve bookmarked it in my google bookmarks to visit then. Hey there. I discovered your site by way of Google whilst searching for a similar topic, your site got here up. It looks good. I have bookmarked it in my google bookmarks to visit then. Hiya, I am really glad I’ve found this information. Nowadays bloggers publish only about gossip and internet stuff and this is really frustrating. A good blog with exciting content, that is what I need. Thank you for making this website, and I will be visiting again. Do you do newsletters by email? Hey there. I discovered your blog by the use of Google whilst looking for a comparable matter, your web site came up. It seems to be good. I’ve bookmarked it in my google bookmarks to come back then. Hi there. I found your blog via Google whilst looking for a similar topic, your website got here up. It seems great. I’ve bookmarked it in my google bookmarks to visit then. Hello there. I found your web site via Google whilst looking for a similar matter, your website came up. It appears great. I have bookmarked it in my google bookmarks to come back then. Hiya, I’m really glad I have found this info. Today bloggers publish only about gossip and web stuff and this is actually frustrating. A good web site with exciting content, that is what I need. Thanks for making this web-site, and I’ll be visiting again. Do you do newsletters by email? Hiya, I’m really glad I’ve found this information. Nowadays bloggers publish only about gossip and web stuff and this is actually irritating. A good site with interesting content, that’s what I need. Thank you for making this site, and I’ll be visiting again. Do you do newsletters by email? Hey there. I found your web site by the use of Google at the same time as searching for a comparable subject, your web site came up. It seems good. I’ve bookmarked it in my google bookmarks to visit then. Hiya, I am really glad I’ve found this info. Nowadays bloggers publish just about gossip and internet stuff and this is really frustrating. A good web site with interesting content, this is what I need. Thank you for making this web-site, and I will be visiting again. Do you do newsletters by email? Hi there. I found your blog via Google while looking for a related matter, your site got here up. It appears good. I have bookmarked it in my google bookmarks to come back then. Hello there. I discovered your site via Google even as looking for a related topic, your web site got here up. It seems to be great. I’ve bookmarked it in my google bookmarks to come back then. Hi there. I discovered your blog by means of Google even as searching for a comparable topic, your website got here up. It looks great. I’ve bookmarked it in my google bookmarks to come back then. Hi there. I found your blog by way of Google whilst looking for a related topic, your website came up. It looks good. I’ve bookmarked it in my google bookmarks to come back then. Hello there. I discovered your website by the use of Google at the same time as looking for a related subject, your web site came up. It looks great. I have bookmarked it in my google bookmarks to visit then. Hi there. I discovered your blog by means of Google whilst looking for a similar matter, your site got here up. It appears great. I have bookmarked it in my google bookmarks to come back then. Hiya, I am really glad I’ve found this info. Nowadays bloggers publish just about gossip and internet stuff and this is actually annoying. A good website with interesting content, that is what I need. Thank you for making this web site, and I’ll be visiting again. Do you do newsletters by email? Hi there. I discovered your website via Google whilst searching for a similar subject, your website got here up. It appears to be great. I have bookmarked it in my google bookmarks to come back then. Hey there. I found your web site by way of Google even as looking for a related matter, your site came up. It looks good. I have bookmarked it in my google bookmarks to come back then. Hello there. I discovered your site by way of Google while looking for a similar subject, your site came up. It seems great. I have bookmarked it in my google bookmarks to visit then. Hello there. I found your blog by the use of Google whilst searching for a similar matter, your website got here up. It appears great. I’ve bookmarked it in my google bookmarks to come back then. Hey there. I found your web site via Google even as looking for a comparable subject, your site got here up. It appears good. I have bookmarked it in my google bookmarks to come back then. Hiya, I am really glad I’ve found this information. Today bloggers publish just about gossip and internet stuff and this is actually annoying. A good site with interesting content, this is what I need. Thanks for making this site, and I will be visiting again. Do you do newsletters by email? Hi there. I discovered your website by the use of Google even as searching for a similar topic, your website got here up. It appears good. I have bookmarked it in my google bookmarks to come back then. hi!,I like your writing very a lot! percentage we be in contact extra about your post on AOL? I need a specialist in this space to solve my problem. May be that’s you! Having a look ahead to see you. Hello there. I discovered your website by the use of Google while looking for a similar topic, your web site got here up. It looks good. I’ve bookmarked it in my google bookmarks to visit then. Hello there. I discovered your web site by the use of Google even as searching for a comparable subject, your web site got here up. It looks good. I’ve bookmarked it in my google bookmarks to come back then. Hiya, I’m really glad I have found this information. Nowadays bloggers publish just about gossip and internet stuff and this is really frustrating. A good site with interesting content, that’s what I need. Thank you for making this website, and I’ll be visiting again. Do you do newsletters by email? Hey there. I found your website via Google even as looking for a comparable topic, your website came up. It appears to be great. I’ve bookmarked it in my google bookmarks to visit then. It’s perfect time to make some plans for the future and it is time to be happy. I’ve read this post and if I could I wish to suggest you some interesting things or suggestions. Maybe you could write next articles referring to this article. I wish to read even more things about it! excellent post, very informative. I’m wondering why the other experts of this sector don’t realize this. You should continue your writing. I am confident, you have a huge readers’ base already! Howdy very nice blog!! Man .. Beautiful .. Superb .. I will bookmark your website and take the feeds also¡KI’m happy to find numerous useful info right here within the post, we want develop extra strategies in this regard, thank you for sharing. . . . . . Thank you a lot for sharing this with all folks you really know what you’re talking about! Bookmarked. Please additionally discuss with my website =). We could have a hyperlink trade agreement among us! Hi there. I found your site via Google whilst searching for a similar subject, your website came up. It looks good. I’ve bookmarked it in my google bookmarks to come back then. Hiya, I’m really glad I’ve found this information. Today bloggers publish just about gossip and net stuff and this is really irritating. A good blog with interesting content, that’s what I need. Thanks for making this web site, and I’ll be visiting again. Do you do newsletters by email? Hey there. I found your web site by the use of Google at the same time as looking for a similar topic, your web site got here up. It seems to be great. I have bookmarked it in my google bookmarks to come back then. Hiya, I’m really glad I have found this info. Today bloggers publish only about gossip and net stuff and this is actually annoying. A good web site with interesting content, that is what I need. Thank you for making this web-site, and I’ll be visiting again. Do you do newsletters by email? Hiya, I am really glad I have found this info. Today bloggers publish only about gossip and net stuff and this is actually frustrating. A good site with interesting content, this is what I need. Thanks for making this web-site, and I’ll be visiting again. Do you do newsletters by email? Hiya, I’m really glad I have found this info. Today bloggers publish only about gossip and web stuff and this is actually annoying. A good web site with interesting content, that is what I need. Thanks for making this website, and I will be visiting again. Do you do newsletters by email? Hello there. I found your web site by way of Google at the same time as searching for a similar topic, your site got here up. It seems good. I’ve bookmarked it in my google bookmarks to visit then. Hiya, I’m really glad I’ve found this information. Nowadays bloggers publish just about gossip and internet stuff and this is actually annoying. A good website with exciting content, this is what I need. Thanks for making this website, and I will be visiting again. Do you do newsletters by email? Hiya, I am really glad I’ve found this info. Today bloggers publish just about gossip and web stuff and this is really annoying. A good website with interesting content, that’s what I need. Thank you for making this website, and I’ll be visiting again. Do you do newsletters by email? Hey there. I discovered your site by way of Google while looking for a similar topic, your site came up. It looks great. I have bookmarked it in my google bookmarks to come back then. Hiya, I am really glad I have found this information. Today bloggers publish only about gossip and net stuff and this is actually frustrating. A good site with interesting content, this is what I need. Thanks for making this site, and I’ll be visiting again. Do you do newsletters by email? Hello there. I discovered your site by means of Google while looking for a similar subject, your site got here up. It appears to be good. I’ve bookmarked it in my google bookmarks to come back then. Hello there. I found your web site via Google whilst searching for a related topic, your website came up. It looks great. I’ve bookmarked it in my google bookmarks to come back then. Hiya, I am really glad I’ve found this information. Nowadays bloggers publish just about gossip and web stuff and this is actually annoying. A good site with exciting content, this is what I need. Thanks for making this website, and I’ll be visiting again. Do you do newsletters by email? Hi there. I found your blog by the use of Google while searching for a similar topic, your website got here up. It looks good. I have bookmarked it in my google bookmarks to visit then. Hiya, I am really glad I have found this information. Today bloggers publish just about gossip and web stuff and this is really annoying. A good web site with interesting content, that’s what I need. Thanks for making this site, and I’ll be visiting again. Do you do newsletters by email? Hi there. I found your website by way of Google whilst searching for a similar matter, your web site got here up. It appears great. I have bookmarked it in my google bookmarks to come back then. Hi there. I found your blog via Google even as searching for a comparable matter, your web site came up. It appears to be great. I have bookmarked it in my google bookmarks to visit then. Hiya, I’m really glad I’ve found this info. Nowadays bloggers publish only about gossip and internet stuff and this is really frustrating. A good web site with interesting content, this is what I need. Thank you for making this site, and I’ll be visiting again. Do you do newsletters by email? Hi there. I discovered your site via Google while looking for a related topic, your web site got here up. It appears to be great. I’ve bookmarked it in my google bookmarks to visit then. Hi there. I discovered your website by way of Google at the same time as looking for a similar subject, your web site came up. It appears to be good. I’ve bookmarked it in my google bookmarks to come back then. Hello there. I discovered your website via Google while searching for a comparable subject, your website came up. It seems good. I’ve bookmarked it in my google bookmarks to visit then. Hiya, I’m really glad I’ve found this information. Today bloggers publish only about gossip and net stuff and this is actually irritating. A good site with exciting content, that is what I need. Thank you for making this web-site, and I’ll be visiting again. Do you do newsletters by email? Hiya, I am really glad I’ve found this info. Today bloggers publish just about gossip and internet stuff and this is really annoying. A good blog with interesting content, this is what I need. Thanks for making this web site, and I’ll be visiting again. Do you do newsletters by email? Hello there. I found your website by way of Google while looking for a comparable subject, your web site came up. It appears good. I have bookmarked it in my google bookmarks to come back then. Hiya, I’m really glad I have found this information. Nowadays bloggers publish just about gossip and web stuff and this is really annoying. A good web site with exciting content, this is what I need. Thank you for making this website, and I’ll be visiting again. Do you do newsletters by email? Hi there. I found your website by way of Google whilst looking for a comparable matter, your web site came up. It appears to be great. I have bookmarked it in my google bookmarks to come back then. Hi there. I discovered your site by way of Google while searching for a similar matter, your website got here up. It looks great. I’ve bookmarked it in my google bookmarks to come back then. Hello there. I found your blog by means of Google even as looking for a similar matter, your website got here up. It looks good. I’ve bookmarked it in my google bookmarks to come back then. Hiya, I am really glad I have found this info. Nowadays bloggers publish just about gossip and web stuff and this is really irritating. A good web site with exciting content, that is what I need. Thank you for making this website, and I’ll be visiting again. Do you do newsletters by email? Hey there. I discovered your blog by means of Google while searching for a comparable matter, your website got here up. It looks great. I’ve bookmarked it in my google bookmarks to come back then. Hiya, I’m really glad I’ve found this information. Today bloggers publish just about gossip and web stuff and this is actually frustrating. A good website with exciting content, that is what I need. Thanks for making this web site, and I’ll be visiting again. Do you do newsletters by email? Hello there. I found your site by way of Google whilst searching for a related matter, your website came up. It appears to be good. I’ve bookmarked it in my google bookmarks to visit then. Hiya, I am really glad I have found this information. Today bloggers publish just about gossip and web stuff and this is actually frustrating. A good blog with interesting content, that is what I need. Thank you for making this web-site, and I’ll be visiting again. Do you do newsletters by email? Hey there. I found your blog by way of Google even as searching for a comparable topic, your website came up. It seems to be good. I have bookmarked it in my google bookmarks to come back then. Hi there. I discovered your blog via Google even as searching for a related subject, your site came up. It seems good. I have bookmarked it in my google bookmarks to come back then. Hi there. I discovered your web site by the use of Google at the same time as searching for a similar topic, your website came up. It seems great. I have bookmarked it in my google bookmarks to come back then. Hey there. I found your web site by way of Google at the same time as searching for a comparable topic, your website got here up. It looks great. I have bookmarked it in my google bookmarks to come back then. Hi there. I discovered your site by the use of Google while searching for a comparable matter, your website got here up. It seems to be great. I have bookmarked it in my google bookmarks to visit then. Hey there. I discovered your blog by the use of Google even as looking for a related topic, your website came up. It looks good. I have bookmarked it in my google bookmarks to come back then. Hey there. I found your site via Google at the same time as searching for a related matter, your site came up. It seems good. I’ve bookmarked it in my google bookmarks to visit then. Hiya, I’m really glad I have found this info. Nowadays bloggers publish just about gossip and web stuff and this is actually irritating. A good blog with exciting content, this is what I need. Thanks for making this site, and I will be visiting again. Do you do newsletters by email? Hello there. I discovered your web site by means of Google while looking for a comparable topic, your website got here up. It appears great. I’ve bookmarked it in my google bookmarks to come back then. Hi there. I found your blog by the use of Google while looking for a similar matter, your site got here up. It seems great. I’ve bookmarked it in my google bookmarks to come back then. Hey there. I found your web site via Google while searching for a similar matter, your web site came up. It looks great. I have bookmarked it in my google bookmarks to visit then. Hiya, I’m really glad I’ve found this information. Today bloggers publish only about gossip and internet stuff and this is actually irritating. A good site with interesting content, that is what I need. Thanks for making this website, and I will be visiting again. Do you do newsletters by email? Hiya, I am really glad I have found this information. Nowadays bloggers publish only about gossip and web stuff and this is really annoying. A good blog with exciting content, that’s what I need. Thank you for making this site, and I’ll be visiting again. Do you do newsletters by email? Hiya, I am really glad I have found this info. Today bloggers publish only about gossip and net stuff and this is really irritating. A good site with exciting content, that is what I need. Thank you for making this web site, and I will be visiting again. Do you do newsletters by email? Hey there. I discovered your web site via Google at the same time as looking for a similar subject, your site got here up. It seems great. I’ve bookmarked it in my google bookmarks to visit then. Hey there. I discovered your blog by way of Google even as searching for a related topic, your web site came up. It appears great. I have bookmarked it in my google bookmarks to visit then. Hiya, I’m really glad I’ve found this information. Nowadays bloggers publish only about gossip and net stuff and this is actually irritating. A good site with interesting content, that’s what I need. Thanks for making this web site, and I will be visiting again. Do you do newsletters by email? Hello there. I found your web site by the use of Google while searching for a related subject, your site got here up. It seems good. I’ve bookmarked it in my google bookmarks to visit then. Hiya, I am really glad I’ve found this info. Today bloggers publish just about gossip and net stuff and this is actually annoying. A good site with exciting content, that’s what I need. Thanks for making this web site, and I’ll be visiting again. Do you do newsletters by email? Hiya, I am really glad I’ve found this information. Nowadays bloggers publish only about gossip and web stuff and this is actually frustrating. A good website with exciting content, that’s what I need. Thanks for making this website, and I’ll be visiting again. Do you do newsletters by email? I have been surfing on-line greater than three hours nowadays, but I by no means found any fascinating article like yours. It¡¦s pretty worth sufficient for me. In my view, if all webmasters and bloggers made just right content as you did, the net shall be much more useful than ever before. Hello there. I discovered your web site by way of Google whilst searching for a comparable topic, your website got here up. It seems good. I have bookmarked it in my google bookmarks to come back then. Hi there. I found your blog via Google even as searching for a related subject, your site got here up. It seems to be good. I’ve bookmarked it in my google bookmarks to visit then. Hiya, I’m really glad I have found this information. Today bloggers publish just about gossip and net stuff and this is really frustrating. A good blog with exciting content, this is what I need. Thanks for making this web site, and I will be visiting again. Do you do newsletters by email? Hey there. I discovered your website by the use of Google while searching for a related topic, your site came up. It appears good. I have bookmarked it in my google bookmarks to come back then. Hi there. I found your blog by the use of Google at the same time as looking for a related topic, your web site got here up. It appears to be good. I have bookmarked it in my google bookmarks to come back then. Hello there. I discovered your website by the use of Google at the same time as searching for a related subject, your web site got here up. It seems good. I’ve bookmarked it in my google bookmarks to visit then. Hiya, I am really glad I’ve found this info. Today bloggers publish only about gossip and web stuff and this is actually irritating. A good website with interesting content, this is what I need. Thank you for making this web-site, and I will be visiting again. Do you do newsletters by email? Hey there. I found your website by the use of Google at the same time as searching for a related topic, your site came up. It seems great. I have bookmarked it in my google bookmarks to come back then. Hiya, I’m really glad I have found this information. Nowadays bloggers publish just about gossip and web stuff and this is really frustrating. A good blog with exciting content, this is what I need. Thank you for making this site, and I’ll be visiting again. Do you do newsletters by email? Hello there. I found your web site by the use of Google even as searching for a similar topic, your site got here up. It appears to be good. I’ve bookmarked it in my google bookmarks to visit then. Hiya, I am really glad I’ve found this information. Today bloggers publish only about gossip and internet stuff and this is actually annoying. A good blog with exciting content, that’s what I need. Thank you for making this web site, and I’ll be visiting again. Do you do newsletters by email? Hello there. I discovered your web site by the use of Google whilst searching for a comparable matter, your web site came up. It seems good. I have bookmarked it in my google bookmarks to come back then. Hello there. I found your blog by means of Google while searching for a related subject, your web site got here up. It seems to be great. I have bookmarked it in my google bookmarks to visit then. Hello there. I discovered your web site by means of Google whilst looking for a similar matter, your web site got here up. It seems good. I’ve bookmarked it in my google bookmarks to visit then. Hey there. I found your website by means of Google while looking for a related subject, your web site got here up. It seems to be good. I have bookmarked it in my google bookmarks to come back then. Hi there. I discovered your blog by the use of Google even as looking for a related topic, your web site came up. It appears to be good. I’ve bookmarked it in my google bookmarks to visit then. Hello there. I found your website by the use of Google even as looking for a related subject, your web site got here up. It seems good. I have bookmarked it in my google bookmarks to visit then. Hey there. I discovered your blog by the use of Google even as looking for a similar matter, your website came up. It appears great. I have bookmarked it in my google bookmarks to visit then. Hiya, I’m really glad I’ve found this information. Today bloggers publish just about gossip and internet stuff and this is actually annoying. A good website with exciting content, that’s what I need. Thanks for making this web site, and I will be visiting again. Do you do newsletters by email? Hiya, I’m really glad I’ve found this information. Today bloggers publish only about gossip and internet stuff and this is really annoying. A good site with exciting content, this is what I need. Thanks for making this website, and I’ll be visiting again. Do you do newsletters by email? I’m still learning from you, as I’m trying to reach my goals. I certainly liked reading all that is posted on your website.Keep the posts coming. I liked it! Hiya, I am really glad I’ve found this information. Nowadays bloggers publish just about gossips and internet and this is really frustrating. A good website with exciting content, this is what I need. Thanks for keeping this web site, I will be visiting it. Do you do newsletters? Can’t find it. Hi there. I found your website by the use of Google whilst searching for a comparable subject, your website got here up. It appears good. I have bookmarked it in my google bookmarks to visit then. Hiya, I am really glad I have found this information. Nowadays bloggers publish only about gossip and net stuff and this is actually frustrating. A good website with interesting content, that’s what I need. Thanks for making this web site, and I will be visiting again. Do you do newsletters by email? Hiya, I’m really glad I have found this information. Nowadays bloggers publish just about gossip and internet stuff and this is actually frustrating. A good site with interesting content, this is what I need. Thanks for making this website, and I’ll be visiting again. Do you do newsletters by email? Hi there. I discovered your web site by the use of Google whilst searching for a related matter, your web site got here up. It looks good. I have bookmarked it in my google bookmarks to come back then. Hiya, I’m really glad I’ve found this info. Nowadays bloggers publish just about gossip and web stuff and this is really annoying. A good web site with interesting content, this is what I need. Thank you for making this site, and I will be visiting again. Do you do newsletters by email? Hi there. I found your web site by means of Google while searching for a similar subject, your website came up. It appears great. I’ve bookmarked it in my google bookmarks to visit then. Hi there. I discovered your web site by way of Google while searching for a comparable matter, your website came up. It seems good. I have bookmarked it in my google bookmarks to come back then. Hi there. I found your web site by the use of Google at the same time as looking for a related subject, your website came up. It seems great. I’ve bookmarked it in my google bookmarks to visit then. Before anything else, I want to commend your quality with this topic. I am no expert on this topic, but just after joining your write-up, my personal understanding has created properly. Please permit me to grasp your rss feed to stay in touch with any potential updates. Reliable job and will pass it on to readers and my online viewers. Hello there. I discovered your blog by means of Google even as looking for a related matter, your web site came up. It seems to be great. I’ve bookmarked it in my google bookmarks to visit then. Hiya, I am really glad I’ve found this information. Today bloggers publish only about gossip and internet stuff and this is actually annoying. A good site with interesting content, that’s what I need. Thanks for making this web-site, and I’ll be visiting again. Do you do newsletters by email? Hi there. I discovered your web site by means of Google even as looking for a comparable topic, your website got here up. It appears good. I have bookmarked it in my google bookmarks to visit then. Hiya, I’m really glad I have found this information. Nowadays bloggers publish just about gossip and net stuff and this is actually frustrating. A good website with interesting content, that’s what I need. Thanks for making this web site, and I’ll be visiting again. Do you do newsletters by email? Hey there. I discovered your site by means of Google even as searching for a related subject, your website got here up. It appears to be great. I have bookmarked it in my google bookmarks to come back then. Hi there. I discovered your web site by means of Google even as searching for a comparable matter, your web site got here up. It seems good. I’ve bookmarked it in my google bookmarks to visit then. Hello there. I found your site via Google even as searching for a related topic, your site came up. It seems good. I’ve bookmarked it in my google bookmarks to visit then. Hiya, I’m really glad I’ve found this information. Nowadays bloggers publish only about gossip and net stuff and this is really frustrating. A good blog with interesting content, that is what I need. Thank you for making this web site, and I will be visiting again. Do you do newsletters by email? Hiya, I’m really glad I’ve found this information. Today bloggers publish just about gossip and net stuff and this is really frustrating. A good blog with exciting content, this is what I need. Thanks for making this website, and I’ll be visiting again. Do you do newsletters by email? Hi there. I discovered your website by the use of Google at the same time as looking for a comparable topic, your site got here up. It seems great. I’ve bookmarked it in my google bookmarks to come back then. Hiya, I’m really glad I have found this info. Nowadays bloggers publish only about gossip and web stuff and this is really frustrating. A good blog with exciting content, that’s what I need. Thanks for making this website, and I will be visiting again. Do you do newsletters by email? Hiya, I am really glad I’ve found this info. Nowadays bloggers publish only about gossip and internet stuff and this is actually irritating. A good blog with interesting content, that is what I need. Thanks for making this website, and I will be visiting again. Do you do newsletters by email? Hi there. I found your website via Google at the same time as looking for a similar subject, your website came up. It appears good. I have bookmarked it in my google bookmarks to visit then. Hiya, I’m really glad I have found this information. Today bloggers publish just about gossip and web stuff and this is really irritating. A good website with interesting content, this is what I need. Thanks for making this web site, and I’ll be visiting again. Do you do newsletters by email? Hiya, I am really glad I have found this info. Today bloggers publish only about gossip and net stuff and this is actually irritating. A good site with exciting content, this is what I need. Thanks for making this web site, and I’ll be visiting again. Do you do newsletters by email? Hi there. I discovered your web site by the use of Google even as looking for a comparable matter, your web site got here up. It seems to be great. I have bookmarked it in my google bookmarks to visit then. Hello there. I found your site by means of Google at the same time as searching for a similar subject, your website came up. It seems great. I’ve bookmarked it in my google bookmarks to visit then. Hiya, I am really glad I’ve found this info. Today bloggers publish just about gossip and net stuff and this is actually annoying. A good blog with exciting content, this is what I need. Thanks for making this web-site, and I’ll be visiting again. Do you do newsletters by email? Hi there. I discovered your web site by the use of Google at the same time as looking for a related topic, your website got here up. It seems good. I’ve bookmarked it in my google bookmarks to come back then. Hiya, I am really glad I’ve found this info. Today bloggers publish only about gossip and web stuff and this is really frustrating. A good site with exciting content, that’s what I need. Thank you for making this website, and I’ll be visiting again. Do you do newsletters by email? Hey there. I discovered your blog by way of Google even as searching for a comparable subject, your site got here up. It looks good. I have bookmarked it in my google bookmarks to visit then. Hiya, I’m really glad I’ve found this information. Today bloggers publish only about gossip and net stuff and this is really irritating. A good blog with interesting content, that is what I need. Thank you for making this web-site, and I will be visiting again. Do you do newsletters by email? Hiya, I am really glad I have found this information. Today bloggers publish only about gossip and internet stuff and this is actually irritating. A good web site with exciting content, that is what I need. Thank you for making this site, and I will be visiting again. Do you do newsletters by email? Hi there. I found your site by the use of Google whilst looking for a similar matter, your website got here up. It appears good. I have bookmarked it in my google bookmarks to visit then. Hey there. I discovered your blog by means of Google while looking for a comparable subject, your web site got here up. It looks good. I’ve bookmarked it in my google bookmarks to visit then. Hey there. I discovered your website by way of Google even as searching for a related matter, your website got here up. It appears good. I have bookmarked it in my google bookmarks to visit then. Hiya, I am really glad I’ve found this information. Nowadays bloggers publish just about gossip and internet stuff and this is really irritating. A good blog with interesting content, that is what I need. Thanks for making this web site, and I will be visiting again. Do you do newsletters by email? Hey there. I discovered your web site via Google even as searching for a comparable subject, your site came up. It appears great. I have bookmarked it in my google bookmarks to visit then. Hey there. I discovered your blog via Google at the same time as looking for a similar matter, your site got here up. It seems good. I have bookmarked it in my google bookmarks to come back then. Hello there. I discovered your site by way of Google while searching for a similar matter, your site came up. It appears to be great. I’ve bookmarked it in my google bookmarks to come back then. Hey there. I found your web site by way of Google at the same time as searching for a comparable matter, your site came up. It appears great. I have bookmarked it in my google bookmarks to visit then. Hiya, I am really glad I have found this information. Today bloggers publish just about gossip and net stuff and this is actually annoying. A good web site with exciting content, that’s what I need. Thank you for making this web site, and I will be visiting again. Do you do newsletters by email? Hiya, I am really glad I’ve found this information. Nowadays bloggers publish just about gossip and net stuff and this is really annoying. A good website with interesting content, that’s what I need. Thank you for making this site, and I will be visiting again. Do you do newsletters by email? Hiya, I’m really glad I have found this information. Nowadays bloggers publish just about gossip and web stuff and this is really frustrating. A good blog with interesting content, this is what I need. Thank you for making this website, and I will be visiting again. Do you do newsletters by email? Hiya, I’m really glad I’ve found this info. Nowadays bloggers publish just about gossip and web stuff and this is really frustrating. A good website with exciting content, this is what I need. Thanks for making this website, and I will be visiting again. Do you do newsletters by email? Hiya, I’m really glad I’ve found this information. Today bloggers publish just about gossip and web stuff and this is actually irritating. A good blog with interesting content, that’s what I need. Thank you for making this web-site, and I will be visiting again. Do you do newsletters by email? Hey there. I discovered your website via Google at the same time as searching for a comparable topic, your website came up. It seems to be good. I’ve bookmarked it in my google bookmarks to come back then. Hi there. I found your web site by means of Google even as searching for a comparable matter, your site came up. It seems to be great. I have bookmarked it in my google bookmarks to visit then. Hi there. I found your blog by the use of Google whilst searching for a similar subject, your site came up. It appears to be good. I have bookmarked it in my google bookmarks to come back then. Hiya, I am really glad I’ve found this information. Nowadays bloggers publish only about gossip and internet stuff and this is actually irritating. A good site with exciting content, that is what I need. Thank you for making this site, and I will be visiting again. Do you do newsletters by email? Hiya, I’m really glad I have found this info. Nowadays bloggers publish only about gossip and internet stuff and this is actually frustrating. A good web site with exciting content, that’s what I need. Thanks for making this web-site, and I will be visiting again. Do you do newsletters by email? Hiya, I’m really glad I’ve found this information. Today bloggers publish just about gossip and web stuff and this is actually frustrating. A good site with interesting content, this is what I need. Thank you for making this web-site, and I’ll be visiting again. Do you do newsletters by email? Hi there. I discovered your web site by way of Google while searching for a similar topic, your website got here up. It appears to be good. I have bookmarked it in my google bookmarks to visit then. Hi there. I found your web site by way of Google while searching for a comparable topic, your web site came up. It looks good. I’ve bookmarked it in my google bookmarks to visit then. Hi there. I found your site by the use of Google while looking for a comparable matter, your site got here up. It seems to be great. I have bookmarked it in my google bookmarks to come back then. Hiya, I am really glad I have found this information. Nowadays bloggers publish only about gossip and web stuff and this is really annoying. A good blog with interesting content, that is what I need. Thank you for making this web site, and I will be visiting again. Do you do newsletters by email? Hi there. I found your site by means of Google even as searching for a similar subject, your site got here up. It appears to be great. I have bookmarked it in my google bookmarks to come back then. Hi there. I discovered your site by means of Google while looking for a related subject, your site came up. It looks good. I have bookmarked it in my google bookmarks to come back then. Hiya, I am really glad I have found this info. Nowadays bloggers publish just about gossip and internet stuff and this is actually annoying. A good website with interesting content, this is what I need. Thank you for making this site, and I will be visiting again. Do you do newsletters by email? Hiya, I am really glad I’ve found this info. Today bloggers publish just about gossip and web stuff and this is actually irritating. A good website with interesting content, that is what I need. Thanks for making this website, and I’ll be visiting again. Do you do newsletters by email? Hello there. I found your web site via Google whilst searching for a related subject, your web site got here up. It appears good. I have bookmarked it in my google bookmarks to visit then. Hiya, I am really glad I’ve found this information. Nowadays bloggers publish only about gossip and internet stuff and this is really irritating. A good blog with interesting content, that is what I need. Thank you for making this website, and I’ll be visiting again. Do you do newsletters by email? Hello there. I discovered your web site via Google even as searching for a related topic, your website came up. It appears great. I have bookmarked it in my google bookmarks to come back then. Hi there. I discovered your site by way of Google while searching for a comparable topic, your site came up. It seems to be good. I’ve bookmarked it in my google bookmarks to come back then. Hiya, I am really glad I have found this info. Nowadays bloggers publish just about gossip and web stuff and this is really frustrating. A good site with interesting content, that’s what I need. Thank you for making this web site, and I will be visiting again. Do you do newsletters by email? Hi there. I found your website by means of Google at the same time as searching for a related topic, your site got here up. It seems to be good. I’ve bookmarked it in my google bookmarks to come back then. Hiya, I am really glad I’ve found this information. Nowadays bloggers publish just about gossip and web stuff and this is really irritating. A good web site with interesting content, that’s what I need. Thanks for making this website, and I’ll be visiting again. Do you do newsletters by email? Hello there. I found your website by the use of Google at the same time as looking for a similar subject, your site got here up. It appears to be good. I have bookmarked it in my google bookmarks to visit then. Hey there. I discovered your website via Google while searching for a related subject, your website got here up. It looks good. I have bookmarked it in my google bookmarks to visit then. Hi there. I found your website by means of Google at the same time as looking for a similar subject, your site came up. It seems great. I have bookmarked it in my google bookmarks to come back then. Hiya, I’m really glad I’ve found this info. Today bloggers publish only about gossip and internet stuff and this is really annoying. A good blog with interesting content, that’s what I need. Thanks for making this site, and I will be visiting again. Do you do newsletters by email? Hello there. I discovered your website by way of Google even as searching for a comparable topic, your website came up. It appears to be great. I have bookmarked it in my google bookmarks to come back then. Hiya, I’m really glad I have found this info. Today bloggers publish just about gossip and web stuff and this is really irritating. A good website with exciting content, this is what I need. Thank you for making this web site, and I’ll be visiting again. Do you do newsletters by email? Hey there. I discovered your web site by way of Google while looking for a related topic, your site got here up. It looks great. I have bookmarked it in my google bookmarks to visit then. Hiya, I am really glad I have found this info. Today bloggers publish only about gossip and net stuff and this is really annoying. A good website with interesting content, that’s what I need. Thanks for making this website, and I’ll be visiting again. Do you do newsletters by email? Hiya, I am really glad I have found this information. Nowadays bloggers publish only about gossip and web stuff and this is really annoying. A good blog with exciting content, that’s what I need. Thanks for making this site, and I will be visiting again. Do you do newsletters by email? Hello there. I found your blog by the use of Google even as searching for a similar subject, your website came up. It appears to be good. I’ve bookmarked it in my google bookmarks to visit then. Hiya, I’m really glad I have found this information. Today bloggers publish only about gossip and net stuff and this is really annoying. A good web site with interesting content, that is what I need. Thank you for making this website, and I’ll be visiting again. Do you do newsletters by email? Hey there. I found your blog by way of Google whilst looking for a related topic, your site got here up. It appears good. I have bookmarked it in my google bookmarks to visit then. Hiya, I am really glad I have found this info. Today bloggers publish only about gossip and web stuff and this is really irritating. A good site with exciting content, that is what I need. Thanks for making this web site, and I will be visiting again. Do you do newsletters by email? Hello there. I found your site by way of Google even as looking for a related topic, your web site got here up. It looks great. I have bookmarked it in my google bookmarks to visit then. Hey there. I found your site by the use of Google even as searching for a related subject, your site came up. It seems to be good. I have bookmarked it in my google bookmarks to visit then. Hiya, I am really glad I’ve found this information. Today bloggers publish only about gossip and net stuff and this is really frustrating. A good website with interesting content, this is what I need. Thank you for making this site, and I will be visiting again. Do you do newsletters by email? Hi there. I discovered your blog by means of Google whilst searching for a comparable subject, your website got here up. It appears to be great. I’ve bookmarked it in my google bookmarks to come back then. Hi there. I found your site by the use of Google whilst searching for a related matter, your web site got here up. It seems good. I have bookmarked it in my google bookmarks to come back then. Hiya, I am really glad I’ve found this information. Today bloggers publish only about gossip and net stuff and this is actually irritating. A good website with interesting content, this is what I need. Thank you for making this website, and I’ll be visiting again. Do you do newsletters by email? Hi there. I found your blog by way of Google even as looking for a similar topic, your web site got here up. It seems great. I’ve bookmarked it in my google bookmarks to visit then. Hey there. I discovered your site by way of Google while searching for a comparable subject, your site got here up. It looks good. I’ve bookmarked it in my google bookmarks to come back then. Hiya, I am really glad I have found this information. Nowadays bloggers publish just about gossip and net stuff and this is really irritating. A good website with interesting content, that is what I need. Thanks for making this website, and I will be visiting again. Do you do newsletters by email? Hiya, I’m really glad I’ve found this information. Today bloggers publish only about gossip and internet stuff and this is really frustrating. A good website with exciting content, that’s what I need. Thank you for making this web-site, and I will be visiting again. Do you do newsletters by email? Hiya, I’m really glad I have found this info. Today bloggers publish only about gossip and web stuff and this is actually frustrating. A good blog with exciting content, that is what I need. Thank you for making this web-site, and I’ll be visiting again. Do you do newsletters by email? Hiya, I am really glad I’ve found this information. Today bloggers publish only about gossip and net stuff and this is actually frustrating. A good site with interesting content, that is what I need. Thank you for making this site, and I will be visiting again. Do you do newsletters by email? Hello there. I found your web site by means of Google whilst looking for a similar subject, your site came up. It appears great. I have bookmarked it in my google bookmarks to come back then. Hiya, I am really glad I have found this information. Today bloggers publish just about gossip and internet stuff and this is really annoying. A good blog with exciting content, this is what I need. Thanks for making this web site, and I’ll be visiting again. Do you do newsletters by email? I must get across my affection for your kindness supporting individuals who require help on in this concept. Your special commitment to passing the message all-around has been wonderfully functional and have empowered guys and women much like me to attain their endeavors. Your amazing useful information denotes a whole lot to me and extremely more to my office workers. Thanks a lot; from all of us. Hiya, I’m really glad I’ve found this information. Today bloggers publish just about gossip and web stuff and this is really frustrating. A good website with interesting content, that’s what I need. Thanks for making this website, and I will be visiting again. Do you do newsletters by email? Hi there. I discovered your site by means of Google whilst searching for a related subject, your site came up. It looks good. I have bookmarked it in my google bookmarks to come back then. Hi there. I discovered your blog by the use of Google while looking for a similar subject, your web site came up. It appears great. I have bookmarked it in my google bookmarks to visit then. Hello there. I found your blog by means of Google at the same time as looking for a comparable subject, your web site came up. It seems to be great. I have bookmarked it in my google bookmarks to come back then. Hiya, I am really glad I’ve found this information. Today bloggers publish just about gossip and web stuff and this is actually frustrating. A good web site with exciting content, that is what I need. Thanks for making this web-site, and I will be visiting again. Do you do newsletters by email? Hiya, I am really glad I have found this information. Today bloggers publish just about gossip and web stuff and this is really frustrating. A good blog with exciting content, this is what I need. Thank you for making this web site, and I will be visiting again. Do you do newsletters by email? Hey there. I found your site by the use of Google at the same time as searching for a similar subject, your site came up. It seems to be great. I have bookmarked it in my google bookmarks to visit then. Hello there. I found your site via Google while looking for a comparable subject, your web site came up. It appears good. I have bookmarked it in my google bookmarks to visit then. Hello there. I found your site by way of Google at the same time as searching for a comparable topic, your web site came up. It looks great. I have bookmarked it in my google bookmarks to come back then. Hiya, I am really glad I’ve found this info. Nowadays bloggers publish only about gossip and net stuff and this is really irritating. A good blog with interesting content, this is what I need. Thank you for making this website, and I will be visiting again. Do you do newsletters by email? Hi there. I discovered your website by means of Google even as searching for a related matter, your site came up. It appears great. I have bookmarked it in my google bookmarks to visit then. Hi there. I discovered your blog by way of Google while looking for a related matter, your site got here up. It appears to be good. I have bookmarked it in my google bookmarks to visit then. Hiya, I’m really glad I have found this information. Today bloggers publish just about gossip and internet stuff and this is actually frustrating. A good web site with exciting content, this is what I need. Thank you for making this web site, and I’ll be visiting again. Do you do newsletters by email? Hello there. I found your blog by the use of Google whilst looking for a comparable subject, your website got here up. It seems to be great. I’ve bookmarked it in my google bookmarks to visit then. Great post. I was checking continuously this blog and I am impressed! Very helpful info specifically the last part 🙂 I care for such info a lot. I was seeking this certain information for a very long time. Thank you and good luck. hello there and thank you for your information – I have definitely picked up anything new from right here. I did however expertise several technical points using this web site, since I experienced to reload the web site many times previous to I could get it to load properly. I had been wondering if your hosting is OK? Not that I’m complaining, but slow loading instances times will often affect your placement in google and can damage your high quality score if ads and marketing with Adwords. Well I am adding this RSS to my e-mail and could look out for a lot more of your respective exciting content. Ensure that you update this again very soon..
Hello.This article was extremely fascinating, especially since I was browsing for thoughts on this subject last couple of days. Hello there. I found your web site by way of Google whilst searching for a comparable matter, your site got here up. It seems good. I have bookmarked it in my google bookmarks to visit then. Hello there. I found your blog by the use of Google whilst searching for a comparable topic, your website came up. It looks good. I’ve bookmarked it in my google bookmarks to visit then. Hiya, I am really glad I have found this information. Today bloggers publish only about gossip and web stuff and this is really irritating. A good blog with interesting content, this is what I need. Thanks for making this web site, and I’ll be visiting again. Do you do newsletters by email? Hiya, I’m really glad I’ve found this information. Today bloggers publish just about gossip and internet stuff and this is actually annoying. A good blog with exciting content, that is what I need. Thanks for making this site, and I will be visiting again. Do you do newsletters by email? Hey there. I discovered your blog by means of Google whilst looking for a related matter, your website got here up. It seems to be great. I’ve bookmarked it in my google bookmarks to visit then. Hey there. I found your website via Google while looking for a comparable matter, your web site got here up. It appears to be great. I have bookmarked it in my google bookmarks to come back then. Hey there. I discovered your web site via Google while looking for a similar subject, your website came up. It seems good. I’ve bookmarked it in my google bookmarks to come back then. Hiya, I’m really glad I’ve found this info. Nowadays bloggers publish just about gossip and web stuff and this is actually annoying. A good blog with interesting content, this is what I need. Thank you for making this web-site, and I will be visiting again. Do you do newsletters by email? Hey there. I found your site by the use of Google at the same time as searching for a related topic, your website got here up. It seems great. I’ve bookmarked it in my google bookmarks to come back then. Hiya, I am really glad I’ve found this info. Today bloggers publish only about gossip and internet stuff and this is actually irritating. A good site with interesting content, that’s what I need. Thank you for making this website, and I will be visiting again. Do you do newsletters by email? Hi there. I discovered your blog by way of Google at the same time as searching for a related matter, your web site came up. It looks great. I’ve bookmarked it in my google bookmarks to visit then. Hello there. I discovered your web site by the use of Google at the same time as searching for a similar topic, your site came up. It appears to be great. I’ve bookmarked it in my google bookmarks to come back then. Hi there. I discovered your web site by means of Google while looking for a similar subject, your website got here up. It looks great. I have bookmarked it in my google bookmarks to visit then. Hiya, I am really glad I have found this info. Today bloggers publish only about gossip and net stuff and this is really annoying. A good web site with interesting content, that is what I need. Thanks for making this website, and I will be visiting again. Do you do newsletters by email? Hi there. I discovered your blog by the use of Google at the same time as searching for a comparable matter, your web site came up. It appears to be great. I’ve bookmarked it in my google bookmarks to visit then. Hey there. I discovered your website by means of Google while looking for a similar topic, your website got here up. It seems good. I have bookmarked it in my google bookmarks to visit then. Hi there. I found your blog by means of Google while searching for a similar matter, your site came up. It looks great. I have bookmarked it in my google bookmarks to visit then.